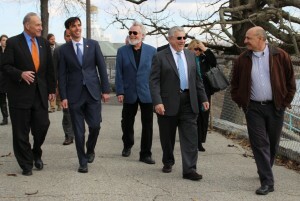 Sen. Schumer and Noam tour Hudson Park with Members of Council. Hudson Park and the Municipal Marina took a big hit during Hurricane Sandy. So after the storm, New Rochelle applied to FEMA for the estimated $4 million cost of repairs. Months and months later, we still haven’t received final word on our approvals. To help with all this, New Rochelle turned to Senators Schumer and Gillibrand, Congressman Engel, and the Governor’s office, and all have been working in concert to get the process going. Today, we got a big boost from Senator Schumer, who made a personal visit to Hudson Park to inspect the storm damage. Then he and I conducted a joint press conference urging FEMA to move ahead quickly. We are very fortunate to have Senator Schumer pressing our case – he’s a terrific and tenacious advocate. There are plenty of folks at FEMA who are working hard, and there’s been good consultation since our applications were filed. But it’s now past time to get this all resolved, so that our waterfront can be fully repaired, and so that New Rochelle’s taxpayers can received the disaster relief to which we are entitled.